This is a mid century modern slatted coffee table bench with an angled design and tapered legs. Dimensions: 36″W x 18″D x 15″H. This is a mid century modern slatted coffee table bench with curved tapered legs. Dimensions: 60″W x 17″D x 15.5″H. This is a rare mid century modern slatted coffee table bench with an angled design, extending sides, and tapered legs. Dimensions: (Closed) 58.5″W, (open) 72″W x 18″D x 14″H. This is a mid century modern coffee slatted coffee table bench with an extending design and tapered legs. Dimensions: 48″W closed, (can extend to any desired width to a maximum of 60″W open) x 18″D x 16″H. These are 2 mid century modern slatted coffee table benches. The first has a rounded edge, angled design, and tapered legs: 60″W x 18.5″D x 15″H. The second has a flat edge design in, and tapered legs: 60″W x 18″D x 15.5″H. Both slatted table benches are sold. This is a mid century modern cedar chest trunk by Lane. It has a beautiful wood grain inside and out, lots of storage space, perfect for a bench. Dimensions: 53.5″W x 18.5″D x 15.5″H. This is a mid century modern slatted coffee table bench with a beautiful curved undulating design and tapered legs. Dimensions: 60″W x 19″D x 13.5″H. This is a mid century modern coffee slatted coffee table bench with an extending design and tapered legs. Dimensions: 52″W (can extend to any desired width to a maximum of 72″ open) x 17″D x 15″H. This is a mid century modern cedar chest sweetheart trunk by Lane. It has a parquet design, and sliding removable valet tray. Dimensions: 53″W x 17.5″D x 20.5″H. 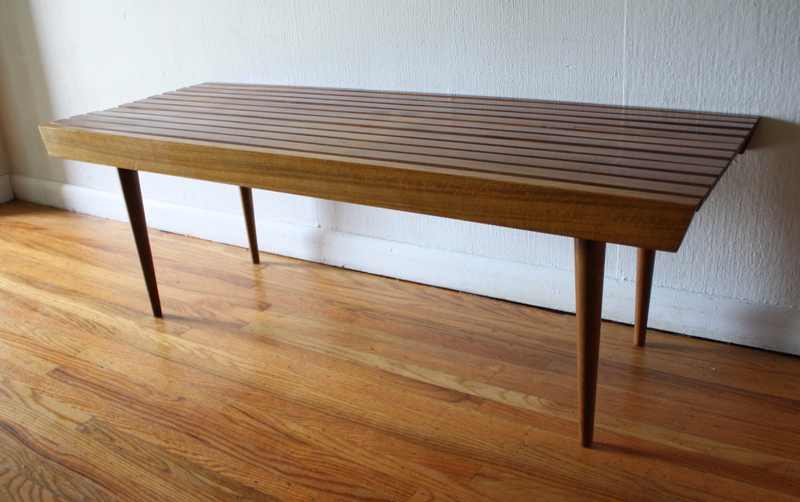 This is a mid century modern coffee table bench with a slatted design, tapered legs, and a beautiful wood grain. Dimensions: 36″W x 18″D x 14.5″H. This is a mid century modern coffee slatted coffee table bench with an extending design and brass tipped tapered legs. Dimensions: 52″W (can extend to any desired width to a maximum of 72″ open) x 17″D x 15″H. 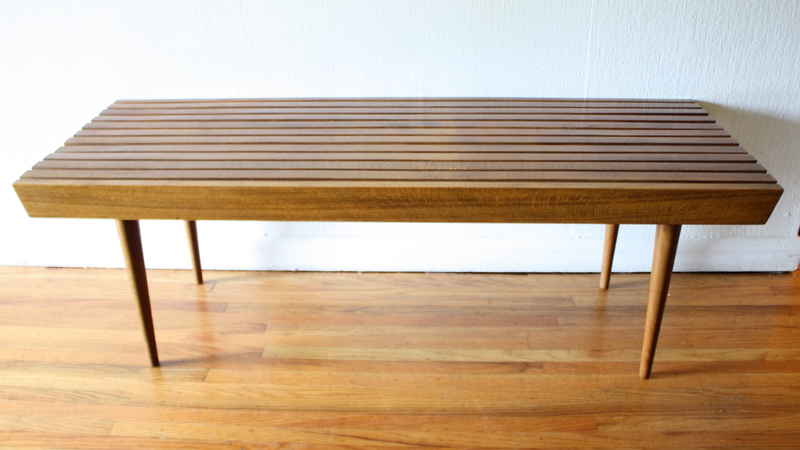 This is a mid century modern coffee table bench with a slatted pegged design, tapered legs, and a beautiful wood grain. Dimensions: 60.5″W x 17″D x 16.5″H. This is a mid century modern coffee table bench with a slatted design, brass tipped tapered legs, and a beautiful wood grain. Dimensions: 60″W x 18″D x 16″H. This is a mid century modern slatted coffee table bench. The first has a flat edge angled slatted design and tapered legs. The second has a rounded edge angled design. Perfect for a coffee table or bench. Dimensions: 36″ W x 18″ D x 14.5″ H.
This is a mid century modern coffee table bench with a slatted design, brass tipped tapered legs, and beautiful wood grain. Dimensions: 59.5″W x 17″D x 15.5″H. This is a mid century modern slatted coffee table bench with extending sides and tapered legs. Dimensions: 48″W (59″W both sides extended) x 18″ D x 16″ H.
This is a mid century modern cedar chest bench by Lane. It has 2 dovetailed drawers with brass pulls, and an upholstered seat that lifts up to trunk storage. Dimensions: 60″W x 18.5″D x 18″H, 20″H with attached cushion. This is a mid century modern slatted bench coffee table. It is made of solid wood, has a great slatted angled design, and tapered legs. We have it in 2 sizes: large: 48″W x 18″D x 16″H; and medium: 36″W x 18″D x 16″H.